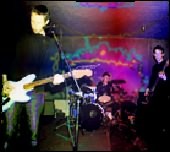 from Terrascope Mag: Thirteen years after the first Spacemen 3 album the Rugby sound continues. 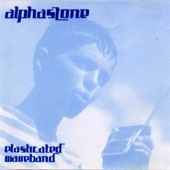 Pete Bassman, ex of the Spacemen 3 and Darkside submits his latest band name: Alphastone. It�s a thickly distorted guitar sound very similar to the Darkside�s but it throws in some jazzy vibes sounds at the end of �lose Your Mind,� which updates it a little. 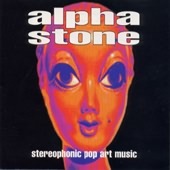 �dans Le Jardin Avec Alphastone� sounds like Suicide, always a major influence, and the slide blues and electronic pulse of �theme to the Leafblower� is a sublime guitar piece. A mysterious black plastic square in the sleeve turns out to be a liquid crystal picture. The Rugby psychers have always tried hard with their packaging. Spiritualized did their luminous covers and pill packets and Spectrum had water in a bubble sleeve and a turning colour wheel cover. Toys for addled minds. After the intro what came next was a very electronic outing. 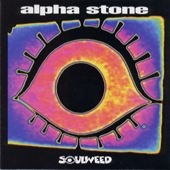 Alpha Stone "Your Not Foolin Me" sounds a lot like Primal Scream, with a hint of Depeche Mode. Which is not a bad thing. "Swamp Gas" sounds like a mashup of the soundtracks of "trainspotting" and "Escape from new York" by someone who smokes lots of pot. Overall very enjoyable. a good album, despite only being recorded on an 8-track. some Spacemen-type noisy stuff, plus more ambient/dance numbers. Probably less consistently good than �soul Weed� though.